Do's and Don'ts of Gambling - Keep it fun! 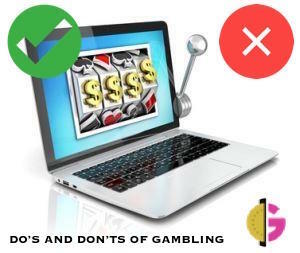 Gambling is an entertaining pastime, but there are a number of do’s and don’ts that you ought to be aware of. Stay safer whilst you play by following these handy rules that we've put together in the table below. Remember this list isn't exhaustive but it does form a good basis to help you enjoy your experience online. When it comes to spending money on gambling games, you want to make sure you don’t overspend. Bankroll management is key if you want to keep on top of what you’re spending and play responsibly. When you’re on a roll, you may be tempted to splash out with more funds, but this isn’t always a good idea. Set your limits for the day or week and then make sure you stick to them. Before you rush off to start playing on a site, you should make sure you’re vetting it fully. This means that you should check their licence and fair play testing too, you don’t want to play somewhere that’s unsafe. With proper vetting, you’ll learn all about the safety and security of the site, before you choose to share your details with them. Look for good customer service, good reviews and top of the line security. The RTP, or return to player, is a percentage that you can find on all slot games on the internet. This is displayed as a percentage and the higher that percentage is the better. This is worked out by the developers and an outside body to work out how many times out of 100 you could expect to win on this game. This varies quite a lot and ideally you want to select a game that has a high RTP. This will affect your chances of winning so make sure you look at this in advance. Look into the fine print on an offer before you go ahead and claim it. What might initially seem like a good offer might end up being restrictive and prevent you from actually being able to withdraw your cash. It’s essential to understand all of the important information surrounding an offer to make sure you’re covered. If you feel that a promotion has been misleading then you can get in touch with the site to rectify it. If that fails, then you can go to the Gambling Commission to help you out. If you feel that emotions are coming into your gambling, such as anger and frustration, then you should recognise this as a time to take a break. This can be a sign of an unhealthy relationship with the pastime and it’s something you want to watch out for. Self-exclusion is there to help you if you feel this happening, as a break can make a huge difference. Taking breaks is good practice, so this is a good habit to get yourself into. Fools rush in, so make sure you’ve done your research on the games and sites before you sign up. You don’t want to end up on a site that doesn’t have much to offer or has poor security. While you can switch and play elsewhere, it’s best to know this before you get started. This can seem boring when you just want to get down to playing games, but it’s worth it! Then you can make the most of better promotions and increased security, it’s a win win. Chasing losses is something you may have heard people refer to, perhaps you've even done it yourself? It's where players continue gambling and even increase their stakes in order to attempt to claw back previous losses. It goes without saying that this is a bad idea, even for those who can afford it. It's a bad attitude to take towards gambling and will usually result in a player losing money. If (and when) you find yourself on a losing streak, the most sensible thing to do is to stop playing and take a break, accepting your loss and moving on will prove healthier than trying to chase your loss. If you do have credit left on a particular site, it could be wise to cash out or if you wish to continue playing, do so after lowering your stake - by doing this your experience will last longer, perhaps giving you a greater chance of your luck changing. This sounds obvious, but we think its well worth pointing out. In order to have a good experience when gambling you'll need to remain in full control. Drinking alcohol is a fast track to losing control. Don't do it! You'll be likely to make decisions you'll regret, such as spending more than you would when sober. The same goes for if you're upset or stressed - at these times you shouldn't be gambling and would be better finding another way to cheer yourself or relax. We hope that this advice helps you to enjoy online gambling in safety and that it helps you to ensure the whole experience remains enjoyable.